By Wayne Creed, Cape Charles Wave My roots are in the clay hills of northeastern Alabama, where for generations my forebears were basically subsistence farmers living on what the land would provide them. Mainly corn, cotton, apricots, and other rotational crops were supplemented with eggs (chickens produced year round). A flock of 100 to 120 chickens lived outside during the day, pecking the dirt for worms and insects, and in the evening returned to the safety of a fairly large corrugated metal and wire chicken house enclosure. This somewhat bucolic memory allowed me for so many years to perpetuate the myth of "cage free" or "free range" organic chicken farming in my own mind. I would argue for the promotion of "organic" family chicken farming in Washington, D.C. and Northern Virginia (where I lived for 25 years), as well as for expanded operations here on the Eastern Shore. That all changed a year ago. As I was traveling to work in Norfolk, I got behind a truckload of caged chickens. The thermometer in my car registered 18 degrees, and as I stopped at a traffic light, I could see each face, crammed in and waiting. I have never been much of an adherer to James Joycean epiphanies, but this was one. It was a realization that I had been very wrong about the myth of the family farm and the possibility of "humane" chicken farming. No matter what justification I tried to use, Morrisey was right: meat is murder - it's unnecessary and just not possible to farm animals humanely. The end of the line would eventually lead to a cage in the back of a truck. I told myself I would try to no longer be party to this. Almost one year later, I find myself on another cold morning traveling Seaside Road on the way to the chicken sanctuary and headquarters of United Poultry Concerns. Karen Davis, PhD, is the president of UPC, which she founded in 1990. UPC is a nonprofit organization "dedicated to the compassionate and respectful treatment of domestic fowl" and addresses the treatment of domestic fowl in "food production, science, education, entertainment, and human companionship situations." Wanting to learn more, the already inquisitive Ms. Davis accepted a summer internship at Farm Sanctuary at Watkins Glen, New York. Involvement in the Farm Animal Rights movement exposed the reality of animal farming. With a finely honed voice in analysis and critique (she was finishing her dissertation on Thomas Hardy at UMD College Park), and an affinity for birds, she turned her energies towards the poultry industry, to in her words "become a camera" and document all of it. While living in a small cottage in Darnstown, Maryland, Ms. Davis started United Poultry Concerns, and also began taking in her first "rescue" chickens. This event led to the creation of the UPC chicken sanctuary, which now houses over 100 birds, including a peacock. Caring for and living with chickens while voraciously reading everything she could about the poultry industry, Ms. Davis began publishing essays such as "Animals and Women: Feminist Theoretical Explorations," "Terrorists or Freedom Fighters: Reflections on the Liberation of Animals," "Animal Liberation Philosophy," and "Chicken-Human Relationships: From Procrustean Genocide to Empathic Anthropomorphism." One of the most important aspects of UPC and Ms. Davis' work is the analysis and deconstruction of the language of agribusiness. Davis notes that, using "farm-speak," animals are referred to as "broilers," "layers," "grass-fed beef," or kept in "veal crates." Referring to these animals by how they will be eaten serves to de-animalize them, to disengage and abstract them from the violence that ultimately leads to their commoditization - from a sentient, living being to somehow nothing but a piece of meat. From a Marxist standpoint, it is impossible to discount the consumer capitalist enterprise in which animals are commoditized (trapped, mutilated, and killed). Animals, once they become part of the assembly line, cease to be chickens, cows, or pigs, but just another commodity. Categorizing them as "food products" allows them to be exploited as a "resource." For Ms. Davis, this inquiry culminated in her brilliant work, "The Holocaust and the Henmaid's Tale: A Case for Comparing Atrocities." Here, she draws parallels between the Holocaust and the institutionalized abuse on factory farms. It's similar to the Isaac Bashevis Singer story, "The Letter Writer," where he offers anecdotes about the Chicago stockyards: "In relation to [animals], all people are Nazis; for the animals, it is an eternal Treblinka." Theory, critique, and analysis are important, but Ms. Davis and UPC hardly exist in a vacuum. Since 1999, UPC has hosted 12 annual conferences on farmed animal advocacy issues. 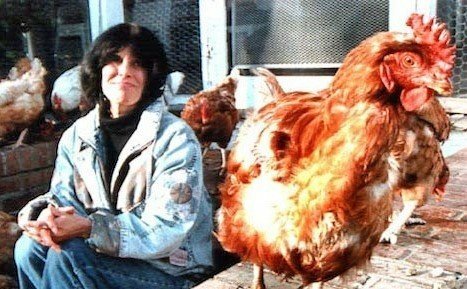 UPC's Forum on Direct Action for Animals, June 26 to 27, 1999, introduced US activists "to the strategy developed by Australian activist Patty Mark, of Open Rescues, in which undercover investigators admit to rescuing animals and documenting the conditions of their abuse." In 2012, 2013, and 2014, UPC hosted conferences in Berkeley, California, on the topic of "Conscious Eating: What is Truly Sustainable?" "For six days until Oct. 1, morning to night, in front of adults, children, and babies, these pitiful birds are swung around the practitioner's head. Then the vocal chords are slit so the chicken cannot scream in pain, and then, still alive, the writhing birds are thrown into a plastic trash bag while still walking and looking for a way out of the bag with the head clinging to a cut throat." Even as Ms. Davis notes that the alliance is not against the ritual in itself (money and other objects can be substituted for chickens), "We want to draw attention to the fact that chickens are needlessly being subjected to extreme cruelty by (some) Kaporos practitioners, all while numerous health laws are being broken." The journey to the Eastern Shore has been a prolific one, yet when talking with Karen Davis, the thing she still cares most about is the birds, especially the ones here on the UPC sanctuary. With a smile, she says she still thinks it's funny that, after outgrowing her Darnstown cottage, she wound up on the Eastern Shore, right in the "heart of the Perdue and Tyson Evil Empire." It is cold out back of UPC headquarters, and it feels like snow really is on the way, yet the birds seem happy and content clucking, pecking, and crowing all under the safe, open, and free enclosure of the sanctuary. As Karen shows me around, relaying stories about these birds (she knows each by name, such as Bisquet, Banya, Rawley the rooster, and Mr. Sippi), they follow us about and you can truly sense the elective affinity between everyone in this place. Watching them interact, it seems so irrelevant to dismiss these birds as not thinking animals, that somehow lack consciousness and don't feel compassion, camaraderie, love, empathy, and even hate (there's a rooster puffing himself up, and doesn't seem too happy to have me so near his hens. I'm keeping an eye on him). For me, I kick the cold, hard dirt, look up at the grey sky, and snap a photo of Frankincense the Peacock, realizing I'm still a pathetic work in progress, sometimes falling short at my favorite Cape Charles restaurants. Although, a funny thing did happen a while ago: after ordering a $30 meal, I couldn't eat the meat on my plate. I got about half way through, and just stopped. The mashed potatoes and salad wedge, however, were delicious. This sympathetic article is featured in this week's edition of the Cape Charles Wave. Comments to the Wave are welcomed and appreciated.